Do you have a hard time saying no, for fear that you will lose relationships? Do you have a hard time asking for the things you want? Does the thought of conflict (of any kind!) make you want to run and hide? I’ll be interviewing an expert in conflict and negotiation, who will teach us how to get what we want, while also protecting our time and relationships. He will give us practical tips and examples for how we can be empowered by difficult conversations, instead of afraid of them. Today on the podcast, I’m interviewing Kwame Christian, a business lawyer, negotiation and conflict expert, and founder and Director of the American Negotiation Institute. He is the host of the popular Negotiate Anything podcast, which has been downloaded over 350,000 times! He also has a TEDx talk called Finding Confidence in Conflict, which was viewed 24,000 times in less than 24 hours. In other words… Kwame is legit. His latest accomplishment is a brand new book, called "Nobody Will Play With Me: How To Use Compassionate Curiosity to Find Confidence in Conflict”. This book is now available on Amazon and it is so good. I’m reading it right now and it has so many practical examples, backed by research, of his framework called Compassionate Curiosity. Kwame knows his stuff you guys and today he’s going to share that knowledge with us as we talk about leaning into difficult conversations and the inspiration behind his book. I know I always say “I’m so excited for this interview today!” And, as we will talk about in this interview, I am easily excitable. However, this interview with Kwame has so much practical advice that is seriously going to change your life and I am truly excited to share this with you! If you listen to this interview and apply what Kwame has to say, you will see an improvement in your own confidence, the way your peers respect you, your ability to get what you want, and the depth of your relationships. And for you my podcast listeners, I want you to be brave. I want to give you all the tools you need in your emotional toolbox to go after all the things you want in life. I know you have big dreams and today’s interview is going to help you get there. 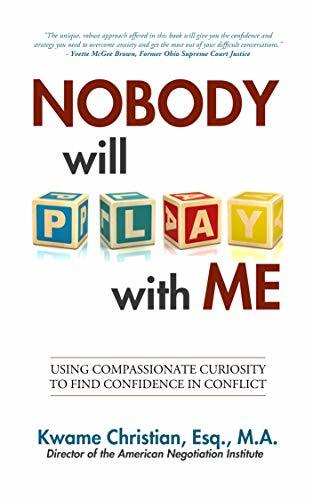 Kwame’s book "Nobody Will Play With Me: How To Use Compassionate Curiosity to Find Confidence in Conflict” is now available on Amazon!! Click here to buy Kwame's Book!